Location: The Hudson River, from Town of Hadley, NY (in the Adirondack Park) to Battery Park in Manhattan; also the Champlain Canal from Whitehall, NY (the head of Lake Champlain) to its confluence with the Hudson River at Fort Edward, NY. As of October 2011, there were 94 designated access points to the Hudson River Greenway Water Trail. Locations are posted online on the Hudson River Greenway website, www.hudsongreenway.ny.gov, and detailed guides are available from the Hudson River Watertrail Association, www.hrwa.org. In 1994, the Hudson River Valley Greenway began working with the volunteer Hudson River Watertrail Association to establish a small boat trail along the 153-mile tidal Hudson River, as a component of the Hudson River Greenway Trail System. In 2001, the Greenway was awarded $1 million to establish a Hudson River Greenway Water Trail. 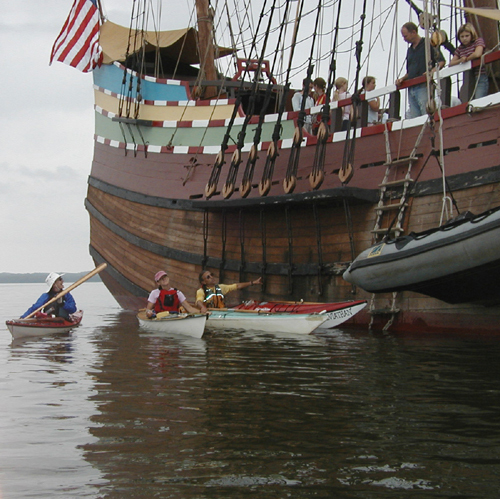 Today the Water Trail begins in two locations: the Town of Hadley in the Adirondack Park, and the Village of Whitehall on Lake Champlain, the terminus of the Champlain Canal. The trail ends at Battery Park in Manhattan and encompasses 256 miles of river and canal. It links with the Lake Champlain Paddlers' Trail and the growing Erie Canalway Water Trail, and overlaps part of the NYC Water Trail. While open to all boaters, the water trail is being designed and built to address the needs of kayakers and canoeists. This means providing one or more access points every 10 miles or less along both shores, overnight accommodations every 15 miles or less, and access to as many day use attractions as possible. Day use attractions include wildlife marshes, islands, historic sites, cities, downtowns and hiking trails. By October 2011, there were 94 designated access sites. The Water Trail effort is coordinated by the Greenway in conjunction with the NYS Office of Parks, Recreation and Historic Preservation (OPRHP), the NYS Dept of Environmental Conservation (DEC), the NYS Dept of State (DOS), the NYS Office of General Services (OGS), NYS Canal Corporation, NYC Parks Dept, Hudson River Park Trust, Hudson River Watertrail Assn., NYC Water Trail Assn., county governments and local shoreline communities. Owners of potential access sites must apply for designation by the Greenway. Each site owner is responsible for management and maintenance of their access site, and must submit a management plan as part of their application. The earliest travelers on the Hudson were Native Americans and the early European explorers and settlers who used the Hudson for travel and a prolific fishery. As our nation grew, the Hudson became a major commercial transportation corridor, linked to the Erie and Champlain Canals. As railroads and roads replaced waterways for commercial transport, the Hudson became used for garbage and sewage disposal. Recreational use of the river nearly disappeared. The environmental awakening in the late 1960s and subsequent cleanup of the Hudson led to renewed interest in using the river for recreation. As the water quality of the Hudson River dramatically improved over the last quarter century, demand for recreational access also increased dramatically. One of the responsibilities of the Greenway is to address that need. The Water Trail is designed for both day users and long distance travelers. For the day user, an immediate goal is to provide launches and day-use attractions along both shores. This is a challenge, since railroads limit access to over seventy percent of the shoreline, including access to many natural, cultural, and historic sites. Kiosks at 12 locations promote the water trail and provide information for water trail users. To facilitate river access and shoreline use, the Greenway has developed an innovative, securable kayak and gear storage rack, and installed 67 of them at 34 shoreline sites. 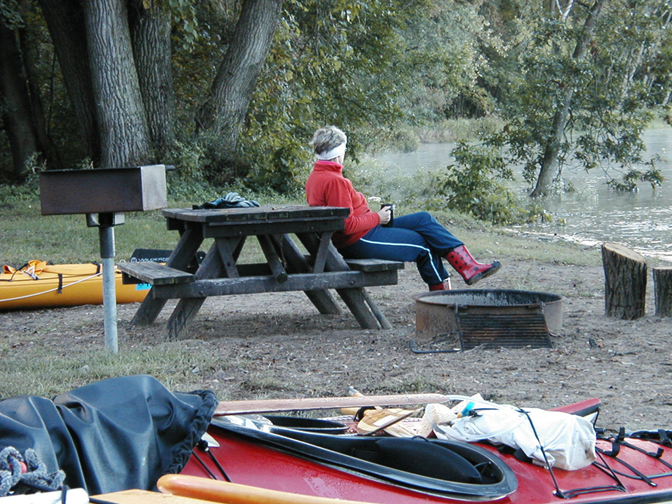 For the long distance paddler, there are currently 11 designated camping sites, 3 awaiting construction, and others that have been used on a special-event basis. When complete, the trail's overnight accommodations may also include hostels or B&Bs. 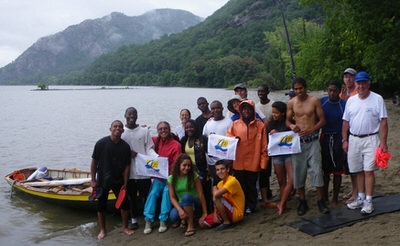 To engage youth in the Hudson River and boating, the Greenway partners with youth-oriented groups such as Building Bridges Building Boats, Floating the Apple and Rocking the Boat, helping to develop facilities and sponsor boating programs. The Greenway has also partnered with high school and college rowing clubs to jointly develop docks usable for both rowing and paddling. For paddlers with disabilities, an accessible kayak ramp was specially designed and installed in a new Paddlesport Center in Hudson Highlands State Park. It became the prototype for others around the country. 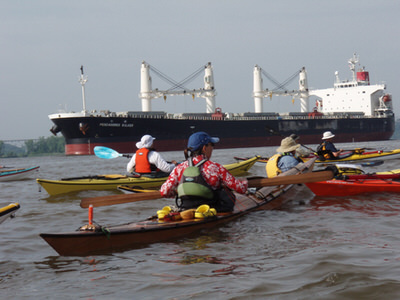 The Hudson is a complicated river where the paddler must consider tides, wind, currents, commercial ships, fast recreational boats, and rapid weather changes. Information on tides and paddling safety is provided on water trail websites, in the Hudson River Watertrail Association's guidebooks, and on 12 shoreline kiosks. 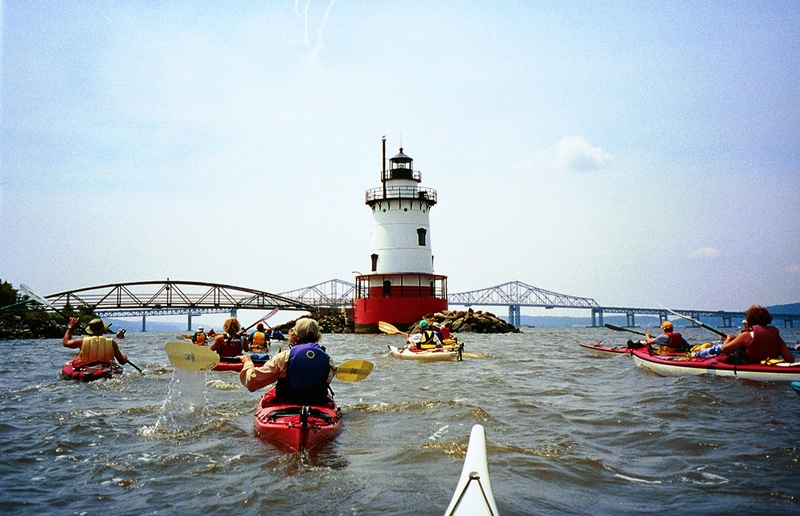 From 2001 to 2010 the Greenway organized the Great Hudson River Paddle, a 150-mile kayaking and camping trip from Albany to Manhattan. In 2009, in celebration of the Hudson-Fulton-Champlain Quadricentennial, the Greenway led a trip 192 miles from Fort Edward to Manhattan. The Greenway constantly strives to promote the heritage and diversity of riverside communities, improved river access, and the Water Trail. In 2011 they revamped the Great Hudson River Paddle into a more diversified series of events. These include short overnight paddles, day paddles, free paddles, paddle races, and any other events their partners dream up.